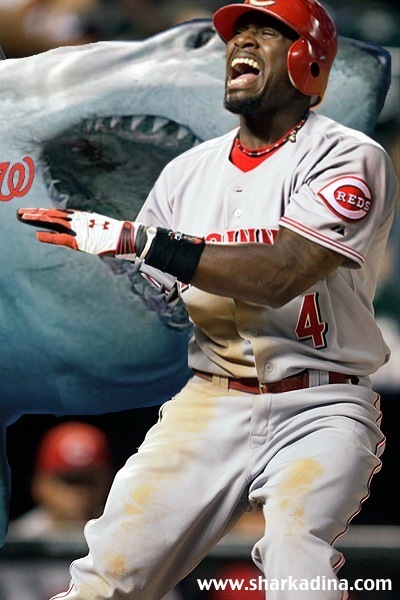 Our long Nationals nightmare is over...The Shark finally got a hit last night! He is now 1-17, which is a batting average of .059, but he's moving in the right direction. After his hit, new Nationals #2 Denard Span drove old Nationals #2 (Bernadina) in with a triple, sealing the Nats 8-1 victory behind Gio's dominant pitching. We are bringing a group of 25 Shark fans to the game tonight, turning the Scoreboard Walk into a Shark Tank! If you're at the game, swim on over and say Hi!